This article outlines many of the customs that have grown up around death in Jewish communities. Many of the practices follow halachah, rulings from the Rabbis of the Talmud, or subsequent decisions from rabbinic authority. As in all Jewish life, the level of observance – or deferring to a rabbinic ruling – varies considerably. Those self-identifying as Orthodox are likely to want to stick to the ‘letter of the law’ as they perceive it, and these rituals may carry significant weight. Progressive, Reconstructionist, Jewish Renewal or post-denominational Jews may wish to adapt, let go of or replace the practices with something else in order to find a response that best works for them. I am not offering a view on what any Jew ‘should’ do in these matters. Regardless of what ‘authority’ anyone sees in these practices, there is much that can be learned from them. First, they have grown up from long experience, and consideration by many deep thinking and caring individuals down the centuries. There is much psychological wisdom in these customs, and, to a large extent, they can be trusted to give mourners and their community an emotional, spiritual and practical container at a time when people might not otherwise know what to do. Second, they weave our experience of death, with Torah, and with Jewish values, identity and history, which can give us comfort and a sense of direction, as well as affirmation of our Jewish selves – the practices are expressed within a particularly Jewish perspective. Third, they can help the mourners and their immediate Jewish community keep in tune with each other, as the principles guide us in what might be generally familiar and expected locally. This last point must be handled sensitively. It is not healing for either the mourner’s or the community’s sensibilities to be ignored or dismissed. This is where well-informed and loving support and leadership from community members can be crucial in helping both the mourners and the community navigate the process. 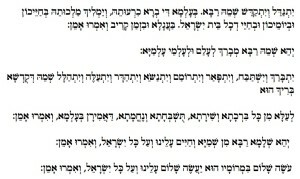 There is only one text that is traditional for mourners, and it is in Aramaic (apart from the last section, Oseh shalom). It does not mention death at all, but affirms life, and faith in God. It is referred to as the Kaddish, or Mourner’s Kaddish, and you’ll find numerous versions of it in English on the internet, as well as translations and transliterations in any siddur (prayer book). It has been included at the end of this article in Hebrew, transliteration, and with a standard translation, as well as a more universalist, non-standard translation-interpretation. In classic observance, kaddish is not said at death. It is said for the first time at the funeral, and then the mourner would say kaddish each day in the synagogue, and it could be said only when a minyan (group of 10 Jewish men) was present; in Conservative communities, women count for making up a minyan, and there are many outside Orthodox or Conservative communities who would be not only egalitarian but also not insist on 10 Jews or even 10 people being present. While the traditional period of mourning is 12 months, Kaddish is recited for only 11 months. The Rabbis of the Talmud taught that a soul must spend a period of purification in the netherworld before fully entering heaven, or olam haba (the ‘world to come’). Even those who needed most purification were said not to need more than 12 months. Therefore, to recite kaddish for the full 12 months would imply that a parent had been a particular active and terrible sinner. To avoid this implication, the custom grew up of reciting kaddish for only 11 months (Shulhan Arukh, Yoreh Deah 376:4). The first 24 hours – The focus is more on honouring the deceased than the mourners, and there is no expectation to make condolence calls until after the funeral. Some mourners might tie a black ribbon on a button. Shemira (standing watch): Mourners may wish to stay with the body and recite psalms immediately after death. Traditionally, the body is watched over from death until burial, with psalms being said continuously. This is to comfort the soul of the deceased, which may be in a confused state. Burial usually within 24 hours. Jewish communities have a permanent chevra kadisha, a group of people who will immediately help make arrangements for care and preparation of the body, funeral and shiva (the home mourning rituals for the few days following). Taharah (or taharah haguf): Ritual preparation of the dead person’s body, including washing, ritual purification and dressing in white linen or cotton. This is done by the chevra kadisha (‘holy friends’), a voluntary group of friends (chevra). It is a three part process, consisting of washing (rechitzah), ritual purification (taharah), and dressing (halbashah). It is accepted that mourners may need to keep a single focus on their grief and the deceased, and so may not care for their own appearance. From the moment a person dies, mourners may choose not to cut their hair or fingernails, or even wash for up to a week. Mirrors (and sometimes pictures) are often put away or turned to the wall – some say this is so that mourners do not think so much about their own appearance, and some believe this prevents the soul of the deceased from being shocked at not seeing their reflection. It is customary to address the mourners with the phrase: “I wish you long life”. Otherwise, you are not expected to begin conversation with a mourner, but wait for them to address you if they wish. Whenever possible, a Jewish funeral takes place within 24 hours of the death, but this is not an absolute requirement. The funeral may be delayed by a few extra days if waiting for key people to arrive from far away, as this is seen as adding to the honour of the dead. The funeral may also be delayed if a doctor’s death certificate has not been issued, if a coroner’s autopsy is required, or if it is Shabbat (see below). There may be prayers said in the home before the funeral. For all moments in the cycle of bereavement, there are prayers and texts appropriate for different circumstances (eg death of a child, acknowledging bereaved children). Prayers and texts: Psalms often used are 8, 23, 91, 103, 121. The Mourner’s Kaddish is recited (for the first time since the death). 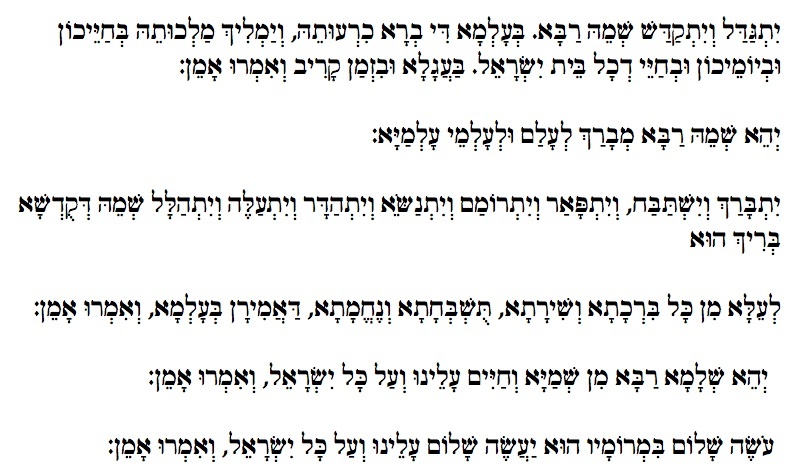 Some include the El male rachamim prayer. Hesped (eulogy): More than one eulogy might be given before and during the funeral, given by family members, members of the community, friends, Jewish or non-Jewish. The most important part of the ceremony is the burial, and it is considered important to aim to ‘accompany the deceased’ (levayah) to the graveside. Those attending the funeral may drop a small amount of soil on the coffin once it is lowered into the grave. They may also use a spade to move soil onto the coffin. This is considered a special mitzvah (good deed) for the deceased. The spade should be left in the ground for the next person to pick up, so that the previous person does not ‘pass on their grief’ to other mourners. Clothing: It is not necessary to wear black, but clothing should be dignified. Men would most likely wear a kippah (small disc of cloth). There is no Jewish legal ruling (halachah) about head coverings at any time, and it is purely a matter of personal choice; however, this is not commonly known, and as many Jews would see it as a sign of respect, whether for God, Judaism, or the environment of a service or ritual moment, it could be deemed an act of consideration and sensitivity for a man (including a non-Jew) to wear a kippah on such an occasion. For bad weather days, by the muddy graveside, plan ahead with appropriate footwear. Flowers are not part of a Jewish funeral. Tzedakah (literally, ‘righteousness’, but often taken to mean charitable giving or activity): some mourners make a donation (or even ask for contributions) towards a charity, their local Jewish community, as a memorial, and extra ‘blessing’ on the deceased. The funeral may take 20-30 minutes – it can be much longer, depending on the eulogy (or eulogies). In addition, time in the cemetery can vary from 15 minutes upwards. Children can attend, as this is seen as an important part of the cycle of life for them to experience. Immediately after the funeral, the mourners may be given a Seudat Havra’ah, the ‘Meal of Consolation’, both to mark the practical and comforting presence of community, but also as a subconscious signal for the mourners to assert their own impulse for life in the face of the death of their loved one. This most often happens at the house of one of the family members. … the Jewish Sabbath, from Friday evening to Saturday evening), and key Jewish holidays. A funeral can take place on a Friday, before Shabbat comes in, but does not take place on Shabbat itself. Shiva prayers (see below), last for 7 days, the day of the funeral being day 1. This means that one of those days will be Shabbat. Since we are commanded to be joyful on Shabbat, it is forbidden to sit shiva from sundown on Friday to sundown on Saturday, or on a Jewish holiday. It is a particular kindness and mitzvah (good deed) to help mourners create a meaningful and life-affirming Shabbat meal and day at this time. A funeral cannot take place on Yom Tov ie Rosh Hashanah, Yom Kippur, Sukkot, Pesach (Passover), or Shavuot. It can take place on Chol HaMoed (the intermediate days of Sukkot or Passover). (See later for more details on customs surrounding shiva). ‘Sitting shiva’ for seven days after the funeral (the funeral being day 1). From this point on, the focus is on the practical, emotional and spiritual needs of the mourners. NB Shiva should not be a noisy, chatty, social ‘catch-up’ session for visitors: Not all those visiting mourners sitting shiva understand what is needed. It is not a ‘social’ occasion or party; the mourners are unlikely to welcome platitudes or comments intended to ‘make the mourner feel better’. Visitors are there to listen, be a presence, a reminder that there are people who care and are ready to offer help when it is asked for. Mourners could consider putting a notice on the door like: “In a Jewish House of Mourning” – Each culture approaches death and the mourning period in its own unique fashion. As a family, we only request that an effort be made to create an atmosphere that is congruous with our Jewish values. Conversations should focus on the life and legacy of Miriam Cohen. No effort should be made to portray her in an artificial light, since this would offend her memory. Painful as it may seem, attempts at distracting family members from thinking or speaking about their loss are not considered appropriate at this time. Thank you, The Cohen Family.” [Source] Visitors can also be guided in this bythe prayer leader setting the right ‘tone’ for the occasion, and the moments after the prayers, with well chosen words. NB Mourners may need guidance and support in the wisdom of shiva customs, so they do not feel that they have to be ‘good hosts’. This happens in one of the mourner’s homes. Mourners are not expected to go out, which saves them from having to ‘put on a public face’. Nichum aveilim (comforting mourners): It is considered a mitzvah (commandment, or good deed) to visit mourners in their home. Services and prayers can be held in the house. Family members may lead the prayers themselves, or a member of the community can help the mourners decide what they want, and also lead the prayers. A member of the community can make sure there are copies of the prayers for everyone. Some people may wish to follow set orders of prayers for Ma’ariv (evening prayer) along with long-established formulae for shiva prayers; others may feel that is oppressive and outside their normative Jewish practice, and therefore ask for a less ‘traditional’ format. Shabbat and Jewish holidays (see earlier): Whenever Shabbat (or a Jewish holiday) falls within the shiva period, it is counted as one of the 7 days, but no formal mourning takes place on that day, though sometimes there might be a Torah reading (with a minyan) at the mourner’s house. If a yom tov (holiday of Rosh Hashanah, Yom Kippur, Sukkot, Pesach, or Shavuot) falls during shiva, even if it begins on the evening of the funeral, the remainder of the shiva is cancelled. The mourner does not have to ‘play host’ at all. Visitors bring simple snacks to share, sort out boiling the kettle for hot drinks etc, and clearing up – they are there to serve and support the mourners. In some communities, the visitors will also bring a set of crockery and cutlery. Mourners do not need to greet visitors, or see them out. It is customary to leave the front door unlocked, so visitors can enter without disturbing the mourners. Prayers and texts: The prayer El male rachamim, for the soul of the deceased, might be used. The mourner may like to offer a eulogy to share something about the life of the deceased. A shiva service is very simple and short; there are only a couple of texts that might be used specifically for a shiva; other than that, the normal prayers for that time of day (mincha for the afternoon, or ma’ariv for the evening) would be said. Even this can be shortened or changed – the point is to create a prayerful event for the mourners in their home, supported by their community. UK Liberal Jews do not keep to the prayers for different times of day, and may recite two or three psalms and Mourner’s Kaddish, have a couple of suitable readings from any source (Jewish or non-Jewish), as well as a eulogy (hesped) from one of the mourners. A shiva service might only be 15-20 minutes, or perhaps 30 minutes at the most, with a eulogy (hesped). Mourners may choose to sit on a low stool. This marks them out as being in a different state from the other people present. There is no music or entertainment. Visitors are not encouraged to speak until the mourner does. And the mourner may choose not to interact with visitors at all. The focus is on the life of the deceased, and the feelings of loss and memories of the mourners. It is not deemed necessary or appropriate to change the subject, distract the mourner from their grief, or make cocktail party conversation. For the first 3 days or so, the mourner might cry and remember the deceased, the focus being on the life of the deceased, and visitors refrain from trying to stop a person remembering or crying. The last 4 days tends to focus on the mourner adjusting and re-entering the world. This is more of an Orthodox perspective, and, of course, mourners need the space to find their own way – without ‘rules’-, supported by those around them. The mourner begins to say the Kaddish prayer regularly (the prayer affirming God in the world). Wherever Shabbat falls within the 7 day Shiva, mourning is suspended, and resumed afterwards – after the Shiva ends, the person might walk around outside – even being encouraged and accompanied by friends -, indicating the transition, and symbolically rejoining the world. It is not customary to give flowers to Jewish mourners. Cards and notes are welcome. For 30 days from the day of burial (including shiva). After the Shiva, although no longer staying in the house or sitting on a low stool, the mourner avoids entertainment or too much involvement with normal activities. For any deceased relative other than a parent, the official mourning period finishes after Shloshim. It is considered a privilege to bring merit to the deceased by studying Torah during this time, perhaps with a group coordinated for the purpose. 30 days is one cycle of the moon (the lunar cycles being integral to the Jewish calendar), and represent one full cycle of waxing and waning – a symbol of the cycle of life. For a deceased parent, the ‘honour your father and mother’ commandment means giving special consideration by mourning for 12 months, with the day of the funeral counting as day 1. Some decide to take up a particular activity for this period (e.g. studying something) as a memorial for the parent. Parents are fundamental to our sense of who we are, and therefore the extended period of mourning recognizes this deep bond, and the profound adjustment we need to make when they die. NB Kaddish is recited daily for only 11 months after the funeral (see earlier). Often referred to as ‘Stone setting’. This can happen at any time after the burial, but some wait until 12 months have elapsed. At the end of the short ceremony, in which psalms (e.g 1, 23, 24, 103) the Mourner’s Kaddish, and the prayer El male rachamim are recited, family members remove a cloth / shroud covering the headstone. Yahrzeit (anniversary): on the Hebrew calendar anniversary each year, the deceased’s passing is commemorated by reciting Kaddish, lighting a memorial (24 hr) candle, and visiting the grave. In Jewish tradition, we do not commemorate the birth of someone who has passed, but their death. The Talmud teaches with the analogy that this is because we do not hold a party for a ship about to set sail, but for its arrival at its destination and the celebration of the journey it has accomplished. Yizkor (remembrance) – a service held 4 times within the Jewish annual cycle, most notably at Yom Kippur, where members of the community collectively remember their deceased loved ones. Visiting gravesides – When visiting a graveside, many place a small stone on the grave as an act of remembrance (even if they did not know the deceased), as well as leaving a sign to others that someone has visited. Flowers are not normally placed there: flowers die, but stones are a lasting reminder. Honorifics: When writing about someone who has died, the custom is often to add an abbreviation that honours them. For a non-rabbinic figure, this is z”l (m. zichrono livrachah, f. zicrhonah livrachah), meaning ‘of blessed memory’, or ‘may his/her memory be a blessing’. For a rabbi, holy, or righteous person, the abbreviation is zt”l or ztz”l (zecher tzadik livrachah), meaning ‘may the memory of the righteous be a blessing’. See Wikipedia entry. [Mourner] Yitgadal v’yitkadash sh’mei raba [all] amein. b’chayechon uv’yom’chon uv’chayei di chol beit yisrael. Ba’agala uvizman kariv v’im’ru: [all] amein. [All]Y’hei sh’meih raba m’vorach l’alam ul’al’mei al’maya. [Mourner] Yitbarach v’yishtabach, v’yitromam v’yit’nasei v’yit’hadar v’yit’aleh v’yit’halal sh’mei d’kud’sha [all] brich hu. tushb’chata v’nechemata, da’amiran b’al’ma, v’im’ru [all] amein. Y’hei sh’lama raba min shamaya v’chayim aleinu v’al kol yisrael, v’im’ru [all] amein. Oseh shalom bimromav hu ya’aseh shalom aleinu v’al kol yisrael, v’im’ru [all] amein. Glorified and sanctified be God’s great name throughout the world which He has created according to His will. May He establish His kingdom in your lifetime and during your days, and within the life of the entire House of Israel, speedily and soon; and let us say, Amen. Blessed and praised, glorified and exalted, extolled and honored, adored and lauded be the name of the Holy One, blessed be He, beyond all the blessings and hymns, praises and consolations that are ever spoken in the world; and let us say, Amen. May there be abundant peace from heaven, and life, for us and for all Israel; and let us say, Amen.He who creates peace in His celestial heights, may He create peace for us and for all Israel;and let us say, Amen. To avoid this implication, the custom grew up of reciting kaddish for only 12 months (Shulhan Arukh, Yoreh Deah 376:4). Yes! Thank you for your keen eye and correction!